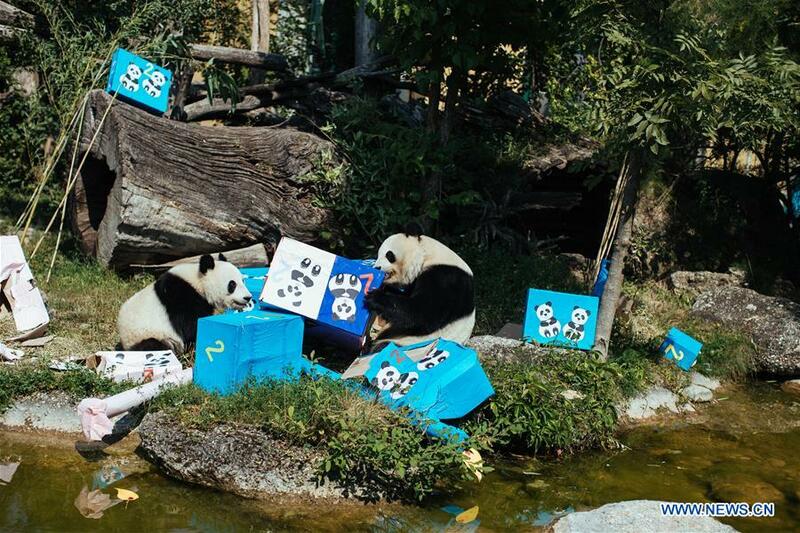 VIENNA, Aug. 7 -- The twin pandas Fu Feng and Fu Ban celebrated their second birthday party with their mother on Tuesday by receiving birthday gifts, packages of potatoes, carrots and special bamboo shoots. The mother, Yang Yang, opened the gift packages first and then joined by Fu Ban, the brother, who was more curious, while the sister Fu Feng was a bit shy, said a panda keeper, adding the whole family is in good health condition. "The twin pandas are both very playful, the female is a bit shy and the boy is more curious, easy to be attracted by new things," a keeper told Xinhua, noting "they also still drink milk from the mother Yang Yang." The twins are also eating bamboos, she added. The twins were born in the summer of 2016. The cubs' father Long Hui died of tumor in December 2016. Yang Yang and Long Hui arrived in Austria in 2003 and they managed to breed five giant pandas naturally at the Schonbrunn Zoo. In Europe, most pandas are bred through artificial insemination. Under the contract signed between China and Austria, the offspring of Yang Yang and Long Hui should be returned to China after two years old. However, due to the hot summer, the twins are supposed to leave for China in autumn, a bit late than expected. The other three offspring of the panda couple, Fu Long, Fu Hu and Fu Bao, which mean lucky Dragon, Tiger, and Leopard respectively, were returned to China after two years old, an age the cubs in the wild should leave their mother. Since the twins are still with the mother, the zoo currently has no plan to find a stepfather for the cubs. "We hope that after the twins have left soon we will get a new male and we also hope Yang Yang will have other offspring in the future," the panda keeper said. The giant pandas are the most famous symbol of the Schonbrunn Zoo which attracts a large number of visitors every year.